prizes! Santa will arrive around 2PM for pictures. You deserve a night out! You NEED a night out! catch a movie and do crafts while you get some time off. a baby-sitter costs and this is MUCH more fun! Space is limited so be sure to call or email to reserve your spot! Registration must be done by October 19th. NOW ENROLLING! 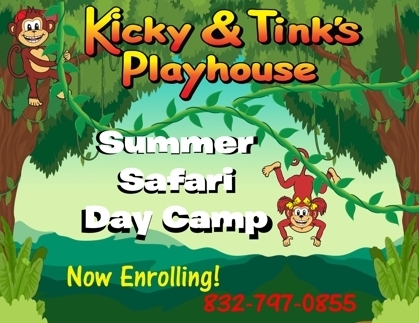 Kicky & Tink's Summer Safari Day Camp! check out our Facebook discounts too! Black-light Easter Egg Hunt - this Saturday, April 4, 2015! 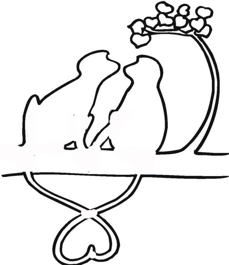 6-8pm. Our jungle floor just got safer, softer and even awesomer! Valentine's Day Parents' Night Out!! Saturday, February 14 from 6pm-10pm. 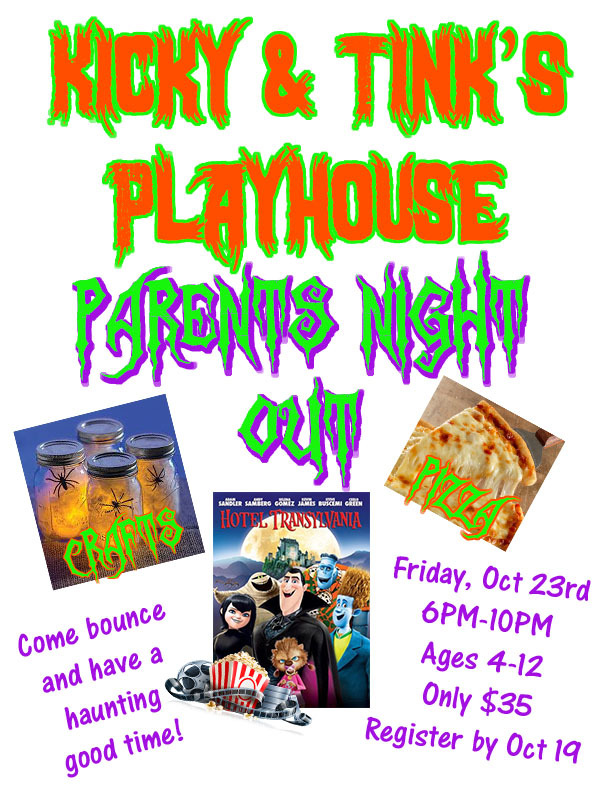 There will be bouncing, movie, crafts, pizza, more bouncing, music. Did we mention bouncing? Cost is only $35 per child and siblings are only $20 (with regular paid admission). RESERVATIONS ARE REQUIRED and space is limited so SIGN UP NOW! Our indoor party facility is NOW OPEN!! Call now to book your TOTALLY PRIVATE party. We will have our bouncers and a HUGE 3-D movie screen and awesome lighting and glow-in-the-dark parties and even a volcano!! Want to take Karaoke to a whole new level?? 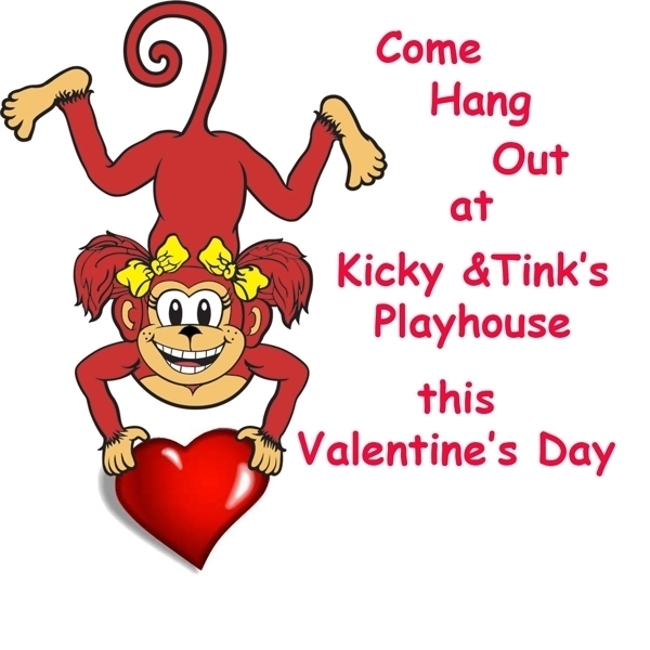 We usually have Open Jungle Jump Wed- Sun 11A-7P (excluding when we have private parties, of course.) Keep posted for more details or follow us on Facebook for updates. Our indoor party facility will be open soon! We will have our bouncers and a HUGE 3-D movie screen and awesome lighting and glow-in-the-dark parties and even a volcano!! We will soon begin enrolling adventurers for our Summer Day Camps. Keep posted for more details or follow us on Facebook for updates. 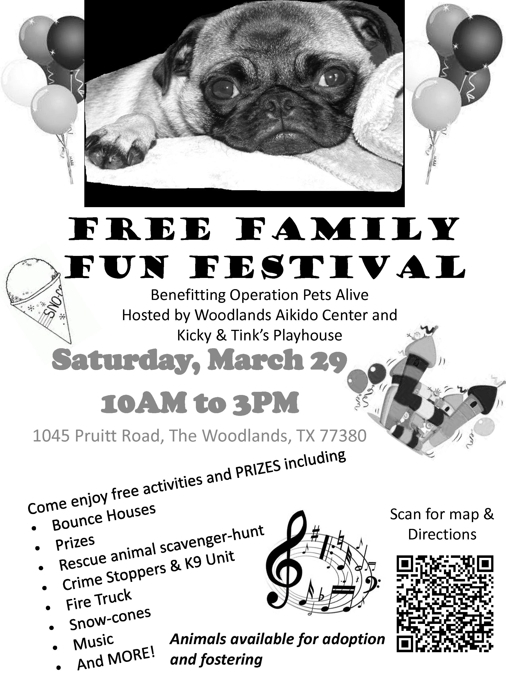 Come see us at the benefit for Operation Pets Alive at the Woodlands Aikido Center March 29! 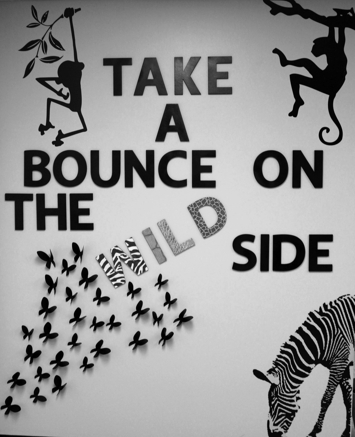 Everybody's New Year's resolution is to bounce more this year, right!!?! If that's not YOUR resolution, it's not too late to change it!!! What a special! Book your party now! Or at least during the month of October and get $100 OFF! Simply make your reservation during October, have your party whenever you're ready and you will get the discount when you pay for your party! We had a great time this weekend!! Thank you to every body who came out to play with us. We have lots of pictures of our new friends and we're so sorry if we missed anyone. Our pictures from this weekend can be found on our Facebook page. Click here to see them. The pictures should be posted on this page soon. 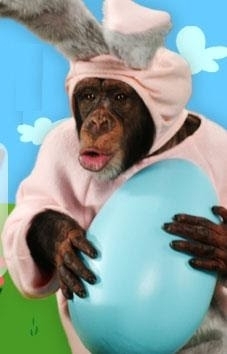 It is hard to get the monkeys to work on their website when you can't keep them out of the bounce houses! But meanwhile come check out the pictures on our Facebook page and feel free to like us while you're there. Please leave us your email to get updates, specials, and new goings on.